We're already in February and spring is rapidly approaching. In a few weeks, the last traces of snow should be gone, and nature will be slowly waking up and shake the last days of cold away. The white will be gone as well and the vivid colors of spring will be on their way to make your days longer, warmer and prettier. That, if you don't like the winter and are more of a spring type of person, of course. If you're not and wish you didn't have to throw away your Christmas tree and continue to live in a cold and white but beautiful world, we have the perfect thing for you. At Puzzle Warehouse, our big collection of winter jigsaw puzzles will allow you to keep your favorite season with you at all times. Browse through our products and let your heart and mind pick the most representative jigsaw puzzle from the list. It could be Winter Majesty, a 1500 pieces marvel from SunsOut, measuring 26” x 32”, or it could be another one just as good looking, or even better. 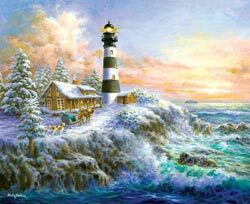 Take a look at our stock of winter jigsaw puzzles, find your favorite, bring it home, assemble it and put it on a wall in a nice frame. This way, winter will always be close to you and no one will be able to take it away. Not even global warming.